As a habitual denizen of the Flushing food court scene, I am forever bringing hungry folks along on ethnojunkets to my favorite stalls. The only downside of this practice is that I invariably order the same reliable dishes so that they can sample the best of the best, but I never urge them to try something I’ve never experienced. I found myself flying solo the other day so I took advantage of the situation. 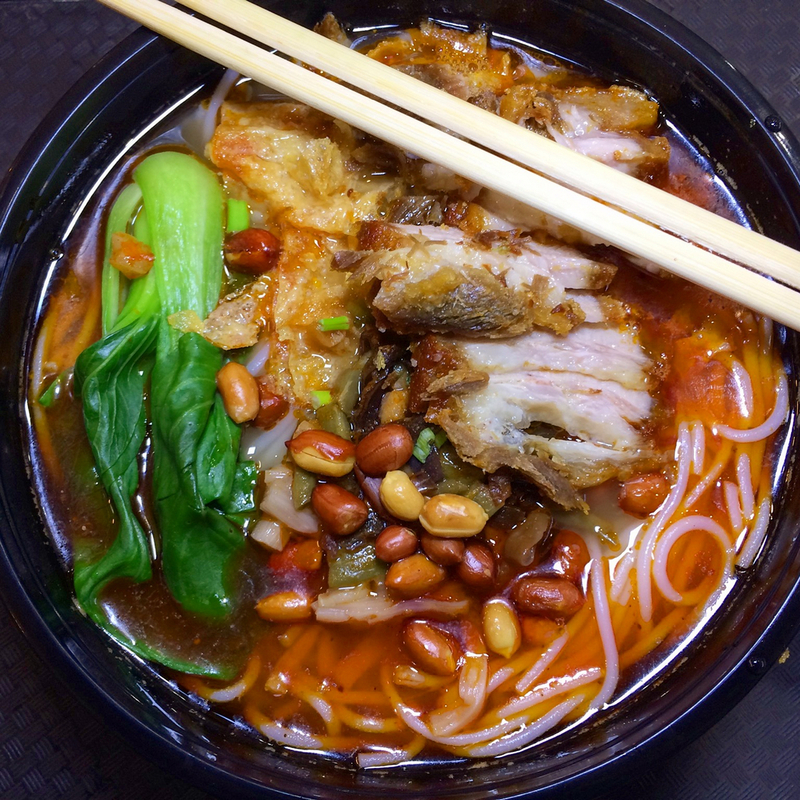 Luo Zhuang Yuan is pretty much the first stall on the left (#26) as you enter the New York Food Court at 133-35 Roosevelt Ave and one of their specialties is Snail Rice Noodle. Of the eight variations they offered, I selected pork, very spicy. The thin noodles were accompanied by roast pig, green bok choy, peanuts and tofu skin, all very familiar of course, in a broth for which I was completely unprepared. I like snails and I anticipated this tasting like, well, snails. Luosifen (螺蛳粉), a specialty of Liuzhou in Southern China, is all about the soup made from river snails and aromatics and it’s one of those love it or hate it foul-smelling flavors that affect people the same way that durian, stinky tofu, limburger, and couldn’t-these-have-been-cleaned-a-little-better intestines have a reputation for. Now I enjoy many, shall we say, “aromatic” foods and perhaps the fact that I wasn’t expecting quite this level of malodorousness brought me up short. Strangely, the questionable charm of the broth seemed only to intensify as I worked my way through the bowl. Needless to say, I went home and hit the interwebs in search of more info. I learned that luosifen almost never contains snail meat, but that’s beside the point. On a more curious note, many of the articles and reviews that I found didn’t even mention its pungent nature. A few, however, confirmed that my initial confrontation was not atypical. So, my friends, I do hope you’ll join me on a food tour soon and I guarantee, as always, that anything we taste will have been thoroughly vetted – and now you know why!